Ideas for creating beautiful and inexpensive gifts that you'll be proud to give is what you'll find here on this page! We all want to give our very best, and when times are lean, it's nice to have a few ideas to fall back on. As you know, making gifts for him is much harder than making gifts for her, so we've gone the extra mile to include nice gentlemen's gift ideas in this list! Some of the gift ideas presented here require certain skill sets, while others can be mastered by just about anyone. In either case we'll supply you with learning resources so you can decide how adventurous you'd like to be. Wishing you every happiness in gift-giving! 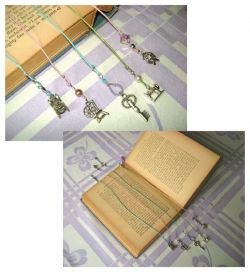 These beautiful bookmarks are elegant to use, and almost like giving the gift of book-jewelry. Avid readers love them! These bookmarks are made using waxed cotton cord (available at craft stores), seed beads, deco glass beads, pewter or silver charms, jewelry wire and/or long wire straight pins (normally used for making bead earrings), jewelry closure loops, and crimping beads (you'll need crimping beads sized to receive double your cord width as you will finish the ends off by doubling back the cord through the crimp bead). What are crimping beads, you ask? Crimping beads are metal "O's" which are used to cinch the cord end so it can be cut and not unravel. (Crimping beads are pinched flat with pliers). Tip: Even though you want the finished bookmark to be about ten to twelve inches from inside bead to inside bead, start out with an 18-inch piece of cord. The reason is it's hard to get the cord through the final crimp bead that second time, so you'll need extra cord so you can keep trimming smashed fibers back until you make it through. You'll see what I mean when you give it a try! Making a flower press is inexpensive and easy, and there are a number of creative ways to finish off the wooden boards. The flower press shown here has a burned design. 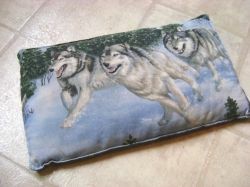 You can also decoupage, paint, apply photographs, or do carving. Most craft supply stores also carry wood plaques that already have beautiful finished edges. You'll need two pieces of half-inch lumber (9x9 square is a good size), white acid free paper, a stack of newspaper, some corrugated cardboard, and depending on the size and shape of your desired press, you'll need two or four 3-inch carriage bolts with wing nuts. Line up your two pieces of lumber, and drill holes through both of them at corners (or ends), slightly larger than your carriage bolts. Put the bolts into one of the boards so you can see what shape the interior pieces of cardboard and paper need to be. Between two sheets of acid-free white paper is where the flowers will be inserted. You'll need roughly three to five pieces of moisture-absorbing newspaper to the outside of each white piece, with cardboard sandwiching the paper layers. A note inside your flower press could wish the recipient happy flower hunting, and explain that bulky flower parts (such as rose hips) need to be trimmed down or removed before pressing. Some flowers, such as roses, are best disassembled for pressing, then "reassembled" with glue into finished art. If the budget allows, there are some wonderful pressed flower art books on the market that would compliment the flower press gift (see recommend below). Salt dough is easy to make, with an infinite number of creative possibilities for use. There are a number of books on the market that are full of wonderful art examples, home decorating ideas, and even practical uses. Keep in mind, however, that some authors claim salt dough projects will last forever. This is not true. Salt eats the dough away over time. My experience is ten years, and items will begin to show signs of breakdown. Still, I wouldn't trade some of my kids' salt dough art for anything in the world! Mix ingredients together in a bowl. Make projects using a dab of water to stick pieces together, and aluminum foil wads in the center of thick pieces (such as dolls) to reduce drying time. Press paper clips into back of items you wish to hang. Bake at 200 degrees F until items sound hard when tapped. Once dry and cool, paint with acrylics, and seal with a varnish. Finished salt dough projects should not be kept in high moisture areas. This is one of those projects that requires a minimum skill set of being able to do basic crochet. If you know how to start, double and single stitch, and end crochet, you can do this project! There is no pattern for this project - you have to be willing to fake it til you make it! I used a fine, light weight yarn, and a smaller size crochet hook suitable to the yarn. Experimentation is the name of the game. 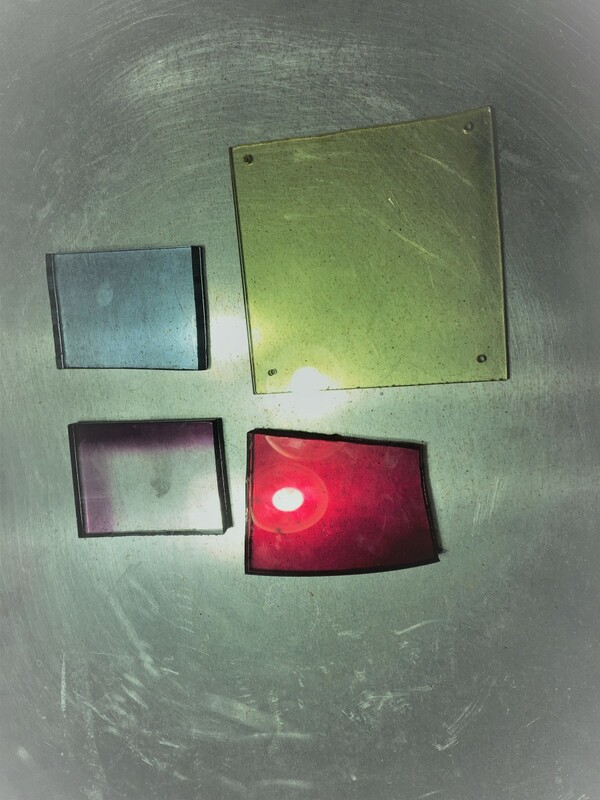 The good news is, the pieces are made quickly, so if they're not right, you can undo and start over, its no big deal. Plug in a movie or some music, and relax while you start out with a little scarf, since it will be a confidence builder! Then make a little hat with a top tassel, little stockings, mittens, and a jacket. I made each item in pieces, such as mitten fronts and backs, then hand sewed them together. The jacket was in five pieces. The long johns were not crocheted, but made out of a scrap of store-bought cotton knit, again with no pattern. I just winged it. You can get tiny doll clothes buttons and miniature clothes pins at your local craft store. Christmas time is the perfect time to watch for little $1 teddy bears at the craft store, and wooden sled tree ornaments that you can paint to match. The tiny little evergreen trees also become easier to find during the Christmas season. I strung this garland on green florist's wire. These are very easy and creative to make! All you need is medium weight beading wire (gold or silver), and decorative glass beads or charms. 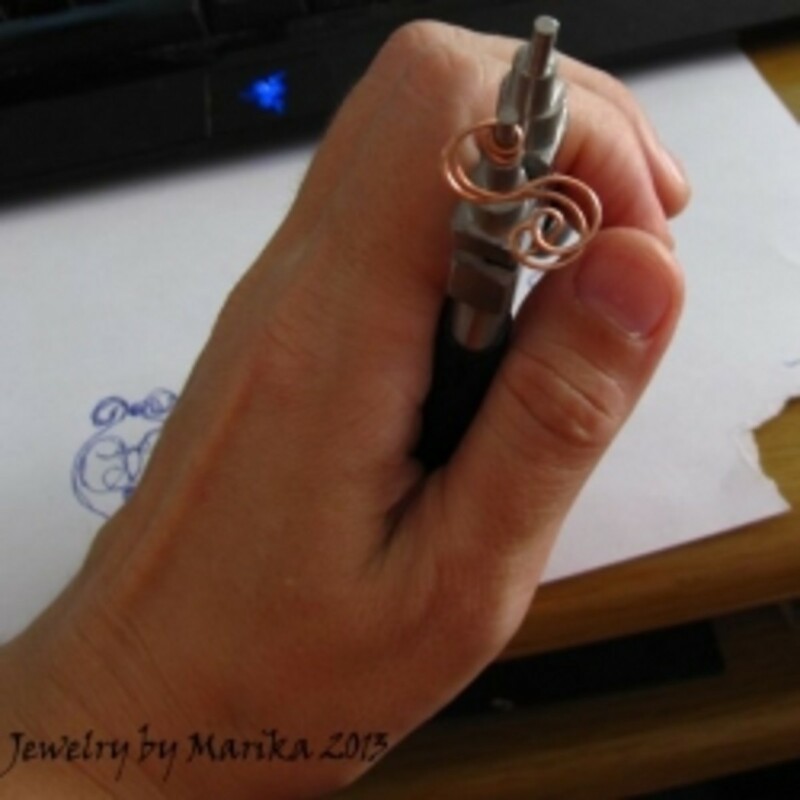 Using a set of beading pliers with round tips, you can make uniform curls in your wires. If you don't have that kind of beading pliers, you can use a meat skewer or the inside ink tube of a pen to wrap wire around. Presentation for this kind of gift is everything! I recommend a piece of velvet fabric over foam board set into the bottom of a nice presentation box. You may be able to get foam board much less expensive at your local dollar store, otherwise craft stores and variety stores carry it. 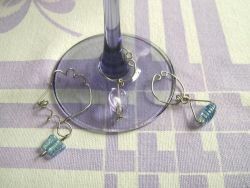 The finished individual wine glass markers can be pinned to the velvet covered board using U-shaped pins, which you can purchase separately, or make out of bent straight pins (tailor's pins). At some point in your life your grown kids will begin to miss your home cooking, even if you weren't / aren't a particularly gifted cook. Every family has their favorites, and it's fun to put those favorites into heirloom cookbooks for posterity. There are a couple options for making the cookbook itself. 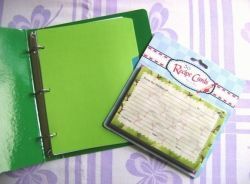 You can buy a small bound or spiral notebook (small 3-ring binder shown), create a one-of-a-kind original cover for it, and paste the recipes inside. Any extra pages can then be torn out and discarded. Another way is to plan your recipe book pages sufficiently to create the pages on the computer, print out and assemble as a book. Another option - if you're pretty handy with the computer - is you can publish a family recipe book through an online on-demand printer (such as Lulu.com, Cafepress.com, or CreateSpace.com), and have your heirloom book professionally printed and shipped to you. You must be able to create pdf files according to your chosen publisher's specs, for both your contents and your cover (or you can order one of their plain-Jane stock covers, and then just decorate it when you receive your copy). If you really want to create a non-reproducible work of art there are a number of how-to titles available on the market that teach the art of hand-crafted book making (see the Amazon module below for recommend). If you know how to make Fimo canes yourself, you'll save big dollars with this project. Fimo canes are just multi-layered rolls of clay that when sliced with a razor blade produce beautiful crosscuts. Ready-made canes can be purchased at your local craft store for about $9 per cane, and as I recall (don't quote me on this), the canes are about three inches long. 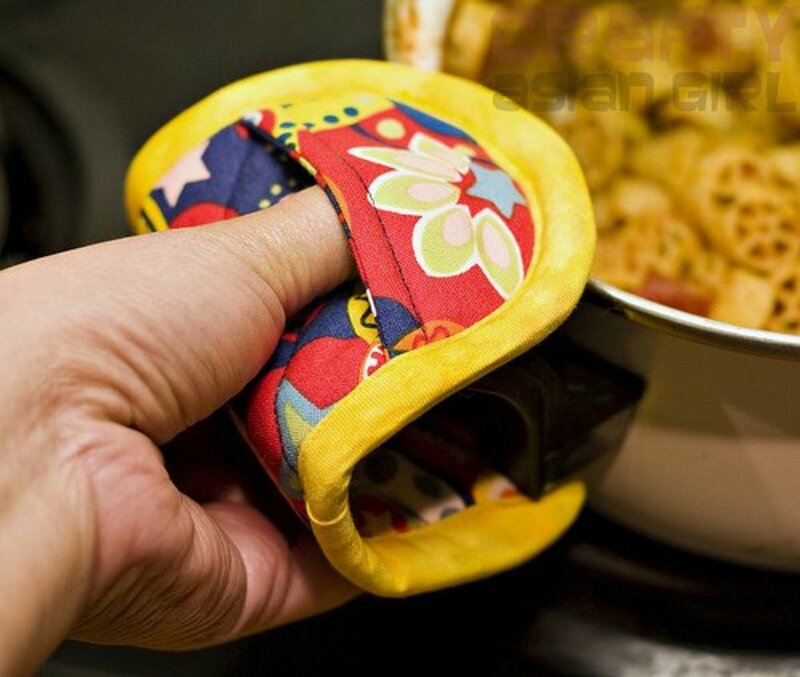 Whatever item you purchase to cover, make sure it can endure the oven-baking that Fimo requires. Generally porcelain with metal hardware will do better than with plastic hardware. Sculpy clay is too soft, in my opinion, for this kind of project. 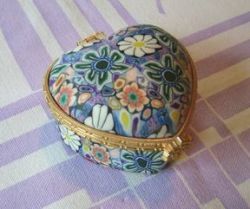 This keepsake box was made by covering a porcelain box purchased at my local dollar store. The Fimo cane was sliced and assembled on my kitchen counter first, pre-smoothed with a rolling pin, then cut and lifted with a metal spatula. It was then applied to the box, smoothed in place first with fingers, then with a small rolling pin (sides), and the inside of a large serving spoon (domed top). I trimmed with an exacto knife, and baked according to Fimo package instructions. Don't bake too long or it will permanently brown your Fimo! For a nice finishing touch you can apply felt to the bottom of your project. 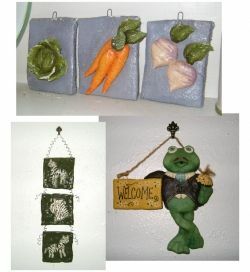 Any themed trio of wood, porcelain, metal, or clay ornaments or picture frames works great for this project. 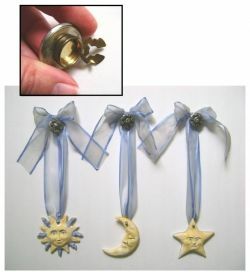 The main finishing touches for this set included the decorative button covers used to cover nail heads, and a silver bead wired on at the front of each ornament, with the wire providing the loop for the ribbon on the back side. The ribbon bow closes the loop at the top. If you wish to do porcelain ornaments, your local craft store may have a variety to choose from, or if not, you can use your yellow pages to find a pottery studio in your area. They often carry a nice variety for their patrons. Keep in mind, too, that there are nice no-fire glazes and paints available through craft supply stores these days. These sheer rosebud garlands are beautiful draped over doorways, or over a dress-maker's form. The rosebuds come pre-made with wire stems, which is essential for attaching them to the ribbon. Start with a seven foot length of 1/4-inch sheer ribbon. 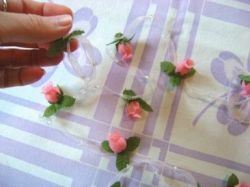 Add two clear "crystal" beads, then a rose bud (attach using it's wire, trim), then two more beads, and repeat. You will find that the first few inches of your ribbon (on both ends because you can work from both sides) becomes ratty looking. Trim that away before tying end knots in your finished ribbon (optional - you can simply diagonal cut your ends). Tip: If you have difficulty threading your ribbon through the beads, use a piece of beading wire bent in half, insert it through the bead, open it wide to thread the ribbon through the wire, then pinch the wire closed and pulled the ribbon through the bead. Very handy! 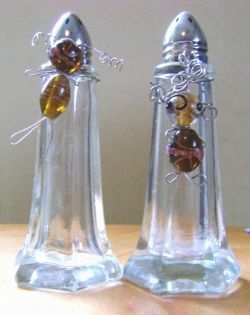 This idea is really easy (wire twists with beads and charms), but not necessarily inexpensive. It depends. If you want to keep costs down for gift-giving to only one or two people, you'll need to look for small, suitable bottles at your local second hand store, decorate them, and then fill them with a modestly-priced store-bought scent. On the other hand, you can spread the cost out for home made perfume and decorated vials by making the same gift for dozens of people. The reason is your supply costs will include shipping, which really adds up. Additionally, good perfume-making instructions are not free, and you'll need to invest in a good source book (see Amazon module below). Don't be fooled by the recipes found online... professional perfumeries guard their trade secrets! Making a perfume that gives off scent all day when worn IS a trade secret! You can buy relatively inexpensive starter kits for perfume labs on eBay. 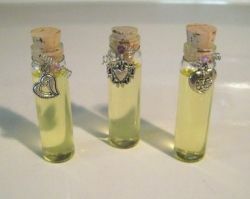 The vials shown here were purchased through PilotVials.com. You've seen these resin-water fakes available at variety stores for around $15+ ready made. 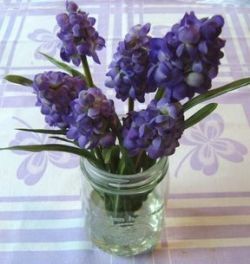 If you are willing to make at least three or four at one time, you can make these country Mason (or Kerr) jar arrangements for about $5 each. You'll need pint jars that are clean and bright looking (second hand stores, or your own pantry). You'll also need some Wonder Water (makes a removable gel that looks like water), or a resin product (makes a solid that looks like water). Both are available through craft stores, and prepared according to package instructions. You'll also need artificial flowers that have a country feel. If you don't already have some suitable artificial flowers on hand, second hand stores are often well stocked with an inexpensive supply of surplus silks. 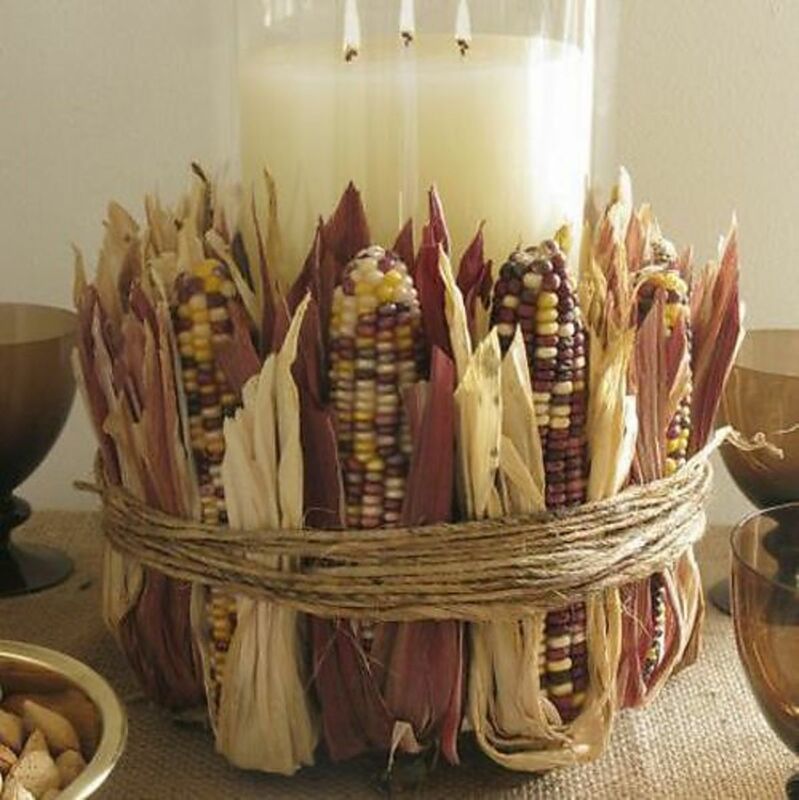 These are inexpensive to make, and beautiful when finished, but very time consuming to produce. 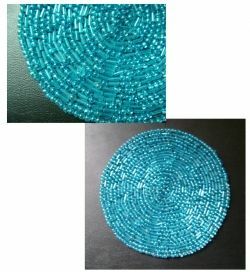 Essentially you are hand stitching glass beads in a spiral, starting form the center, to a piece of fabric that has been finished, or will be finished to prevent fraying at the edges. Once done, your fabric side is covered with a finishing layer that hides the needlework on the under side. 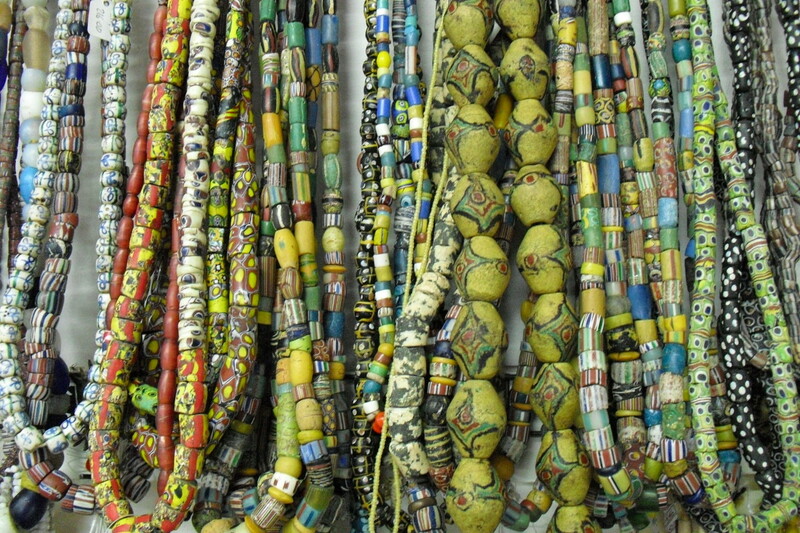 It's important that whatever beads you choose, be sure they do NOT bleed when made wet. (Bugle beads are often culprits!) Your chosen fabrics should also be water-tolerant and non-bleeding. You can purchase a non-raveling swatch of fabric to bead to, or you can tuck raw edges under, or you can finish off fabric edges with No-Fray fabric glue (available through fabric supply stores). Your final under-side covering will be the challenge, as you want a very clean edge. One option is to finish off the under side with vinyl, foam, or rubber sheeting. Really cute and fun! Make using large glass beads, and medium-weight beading wire. Round nose beading pliers are handy as you can twist the wire around the tips in the shape of curly hair ringlets. If you don't have round nose beading pliers, just twist wire around a meat skewer, or the inside tube of a fountain pen. Salt and pepper shakers can be purchased inexpensive through your local dollar store. I purchased the vintage set shown here at an antique shop for $5. 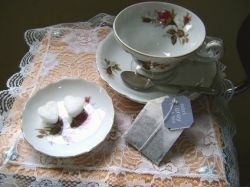 Hand made sugar cubes are easy to make, and wonderful to give by themselves, or in tea gift sets. To make sugar cube "dough" for molds, combine 1/4 cup of white granulated sugar with up to 1.5 tsp of water added gradually as needed to foster clumping (the less, the better). Pack the mixture into candy molds or a specialty "shape" ice cube tray. Allow to dry out overnight, then remove. If you wish to make colored sugar cubes add food coloring to the water before measuring it. Another idea I've seen but never tried, is making tiny frosting flowers on top of individual store-bought sugar cubes, and presenting a batch of them together in a clear box. 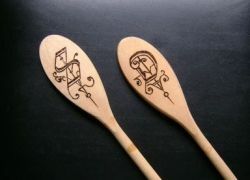 Even on these inexpensive dollar store wooden spoons, burned monograms look like a million bucks! Just think how lovely this gift would be on NICE wooden spoons, or even on hand carved wooden spoons! You can get lettering ideas online using free font websites such as UrbanFonts.com, or 1001FreeFonts.com. Just google "fonts," or "free fonts," and hunt for your favorite monogram styles (those pictured here are of the "Old English" class). Lightly sketch the letters in pencil (erasable when using a vinyl eraser), then burn over the markings with a wood burning iron. 1. Flatten an open, untreated 3x24" aluminum vent pipe, available through hardware stores (cost: ~ $4). The aluminum should be heavier than cooking aluminum, but not too heavy to cut with hand scissors. 2. Mark strips with a straight edge (this cutter was large, requiring an 18-inch strip). Cut. Bend down one edge (as a guard for the hand). 3. 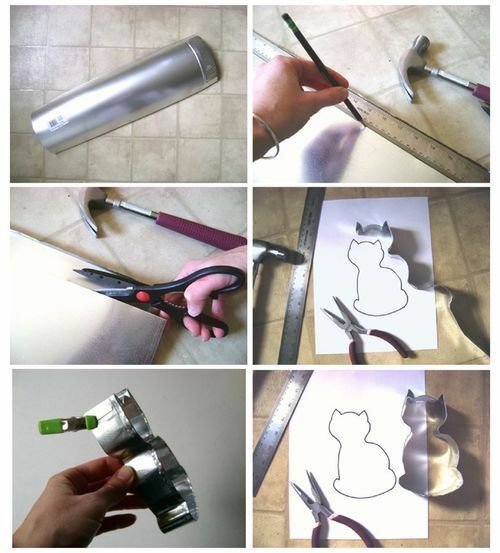 Using a paper outline as a pattern, shape your cutter with pliers and fingers. Top fold should be to the outside. It helps if the joint is at a point or corner, such as the cat's ear in this case. 4. Glue joint using JB Weld. JB Weld is dishwasher and food safe when cured. Available through hardware stores (cost: ~ $7). 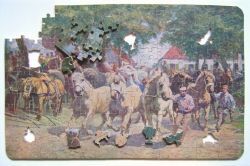 Hand cut wooden jigsaw puzzles make GORGEOUS heirloom items with loads of nostalgic charm! You can use magazine pictures, or laser-printed images (on thin, slick paper). This puzzle was made using a 1902 Chicago Tribune art supplement which I purchased on ebay for under $12. Wood and glue are the only other material expenses required, assuming you have access to a scroll saw and replacement blades. If you look close you'll notice my puzzle has figural pieces in it... something reminiscent of the wooden puzzles cut during the Depression era. Everybody loves figurals! Anyone can learn to craft wooden jigsaws. If you'd like to spare yourself the time and headache of learning by trial and error like I did, LetsPlayHistory.org offers a $7.99 pdf how-to download titled,The History and Craft of Wooden Jigsaw Puzzles. (The book is also available in print through Amazon/CreateSpace for $14.99, and through the author's storefront at TeachersPayTeachers.com, again a $7.99 pdf download.) This easy to read guide details both modern and historical instructions and techniques, and walks you through lumber options, as well as glue options (this is not the place for Elmer's school glue!). You'll learn how to properly apply the surface picture, and how to make intricate cuts without having to draw on your surface art. 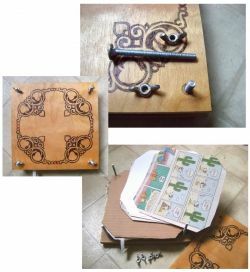 You'll also get tips on blades, scroll saws, stack cutting, and even Depression Era instructions for making your own puzzle boxes in authentic 1930's-style. 1. 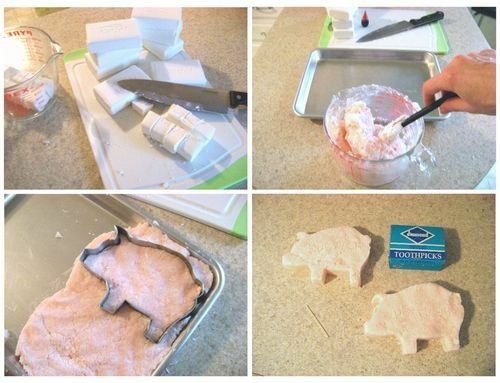 Make a "hog" cookie cutter using instructions above. 2. Cut up bars of Ivory soap into 1-inch squares (cost: ~$6 / 10 bars). Soften in microwave 30 seconds at a time (this soap does not "melt," it "foams up"). Stir with each softening, and add coloring when smooth enough to stir in. In this case, a drop of red liquid food coloring is all it took for a piggy pink. 3. When color is evenly distributed, and while soap is warm, push into a baking sheet as shown, and immediately cut out and set aside your pig bars. Using a toothpick write "HOGWASH" on your soap bars. Allow to cool. 4. Optionally package with a bath towel set, or use as stocking stuffers. These are just cotton fabric bags filled with rice, but they get amazing winter-time mileage by appreciative recipients! Your chosen fabric must be 100% cotton, as man made fibers can melt in the microwave. Cut two approximate 7x11-inch pieces. You'll also need 1.5 pounds of rice per bag (whole or white, which ever is the least expensive). Optionally you can also use a couple drops of an essential oil for fragrance. The fragrance won't last forever, but it's a nice touch for gift-giving. The bags should be sewn on three sides to form a sack, using a traditional 5/8-inch seam allowance. You can hand or machine sew, but if you hand sew, keep the stitches small. I always top stitch a secure edge on my bags for durability (I top-stitch the three sides before filling the bag - see picture). If adding a scent, put your rice in a bowl and mix first to spread the oil. Fill your sack. Sew the fourth edge closed, and top-stitch (optional). This gift is not necessarily cheap to pull together, but you should be able to keep it under $20 if you shop creatively through second hand and dollar stores. Essentially you're filling a box with items that appeal to the recipient's five natural senses: sight, sound, smell, taste, and touch. You can also include spiritual senses, if you like. In the interior of the box lid you instruct the user to try to engage as many senses at once as possible to achieve the best stress-relief. 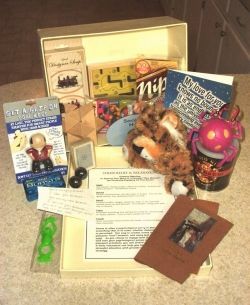 Stress relief kits can include things like dollar store classical music CD's, play dough, gum, scented candles, little puzzles, favorite family pictures, a box of kind or uplifting sayings, favorite childhood toys, etc., etc.. Whatever you think will engage and pamper the recipient. I kid you not, these marshmallow blow guns made for one of THE BEST, most memorable Christmas morning gifts Santa ever brought the family! And they were CHEAP! You'll need 3/4-inch PVC pipe cut into 2-foot lengths (I used a chop saw). You'll need 1-inch nails, a drill and bit for nail holes, and duct tape for a decorative finish. 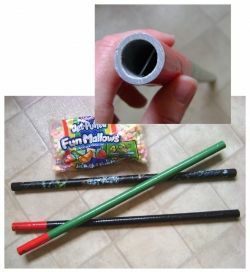 You can barely see it in the picture here, but you'll want to install a marshmallow stopper one-inch in on the mouth end of each blowgun (prevents accidental marshmallow inhalation). This is done by drilling pilot holes through one end of each blow gun, then inserting a nail through the holes, and trimming the nail tip with pliers. File smooth if necessary. Now just wrap your blow guns in duct tape, and you're good to go! 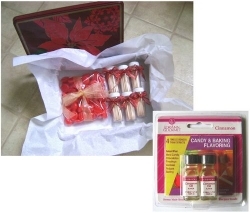 Other ideas include making cinnamon candy or breath mints (shown), cinnamon cookies, or dehydrated apple slices pre-dusted with cinnamon sugar. For that matter, you could include a fancy jar of cinnamon sugar for dusting, or make brown sugar and cinnamon streusel cubes to drop in coffee or hot cider (see sugar cube recipe above, and adapt accordingly). Family fan charts are a fun challenge to fill in as an ongoing genealogy project. 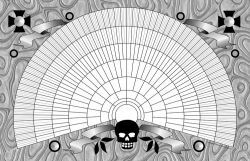 The decorative 11x17 black and white "skull" genealogy chart shown here records nine generations, and is available as a reproducible pdf download for $2.99 through the LetsPlayHistory.org Store. Just take the file to your local print shop and have it printed out (most likely under .25 cents). I recommend mat, not slick paper, as slick paper is hard to write on. Create a beautiful old-fashioned display using this chart and a few heirloom family photos. Add to that family stories in print, or on tape or CD, and all your loving efforts will melt the heart of any devoted family man! If you think your guy would prefer a scrapbook format instead, this type of decorative fan chart can also be three hole punched and folded for insertion into an album. Other types of genealogy charts can be found online by Googling "genealogy charts." Directory of crafts related websites and discussion groups. These are some great ideas, blessed! You've featured some very nice homemade Christmas gift ideas here!